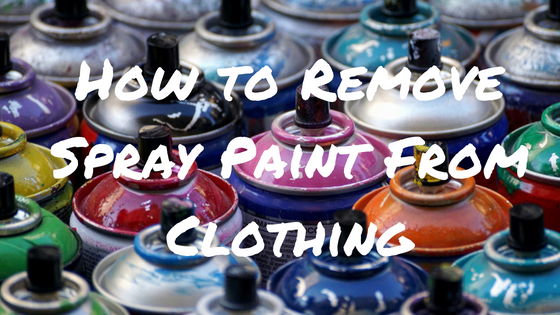 Are you looking for a way to get spray paint out of clothes? My husband came home with bright pink spray paint on his work pants from sitting in a newly gratified train carriage and I thought that was the end of those pants - but no! It was actually incredibly easy to remove and the secret is hair spray! I really wish I had taken a video of the removal process because it was simply magic and unbelievable unless you can see it for yourself. The spray paint literally disappears before my eyes just with just hairspray and a bit of scrubbing on the more stubborn stain. Here is how I removed spray paint from the garment .. Step 1: Spray hairspray directly on the stain long enough to soak the fabric with hairspray. If you have a minor stain you might see the spray paint disappear completely. If you have a more difficult stain you will see a dulling in the intensity of the spray paint. If you can still see the stain, continue on to step 2 or skip straight to step 3 if you can't see the stain anymore. Step 2: With a plastic bristle brush (e.g. scrubbing brush), gently scrub the stain. Remember that you don't want to damage the fabric. With a little bit of scrubbing you should see the stain completely disappear. Step 3: Wash the garment as you normally would. I have heard that this method works best with extra strong hairspray. I personally used a Schwarzkopf Strong Styling Hairspray with a hold of 4 out of 5 and had excellent results. If you have any concerns with this method for your particular garment, be sure to do a patch test first on an inconspicuous area of the garment.